NEW YORK, New York — Magic moments at conferences usually occur off-stage at these highly coordinated events of high talent and connectivity. I wasn’t disappointed. As the cocktail party quieted down, and Ted Turner and other guests segued to dinner and off-site discussion, I found Jim Kelly, Time‘s managing editor, taking in the glorious view of Columbus Circle from the tiered floor of Jazz at Lincoln Center. He was warm, enthused and focused, a trait common of Time Magazine staffers. He invited me to join him, photographer Jim Nachtwey, Time‘s photo director Michelle Stephenson, and photo editor Mary Anne Golon for a moving tour of Nachtwey’s photographs, shot for the Time cover story. Others joined us, including the president of Canon. J. Carl Ganter at Global Health Summit. It was a reunion of sorts — I first met Jim Nachtwey when I was in college and photographing for the Day in the Life books and when I participated in editing sessions of his work at National Geographic. It was great, too, to spend time with Michelle and Mary Anne. I had been an intern — gads — 20 years ago, when Michelle was assistant director of photography and when Mary Anne was a section editor. Jim’s walkthrough of his images drew tears and reminded us all — yet again and again — the power of the moment. One picture, etching itself upon our souls, was of the exact moment when a woman’s seven-year-old daughter took her last breath. The anguish, the horror, the tragedy of another preventable disease. 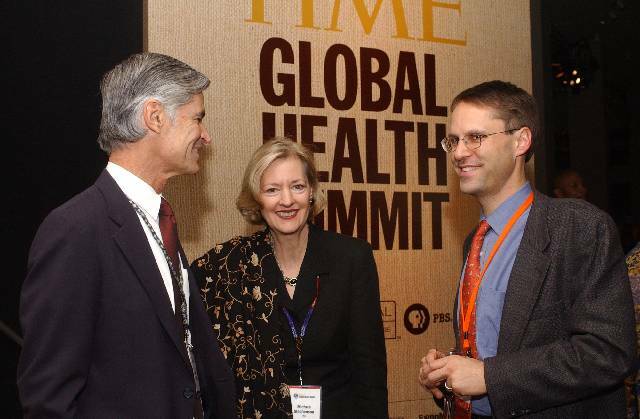 Missed The Story, Again Time Global Health Summit: Hope?